We love a good gyro, especially when it’s topped with enough zingy tzatziki sauce to make a finger-lickin’ mess. These chicken gyros are like a healthy meal masquerading around as comfort food. And, if you use store-bought yogurt, they’re ready in no time flat. 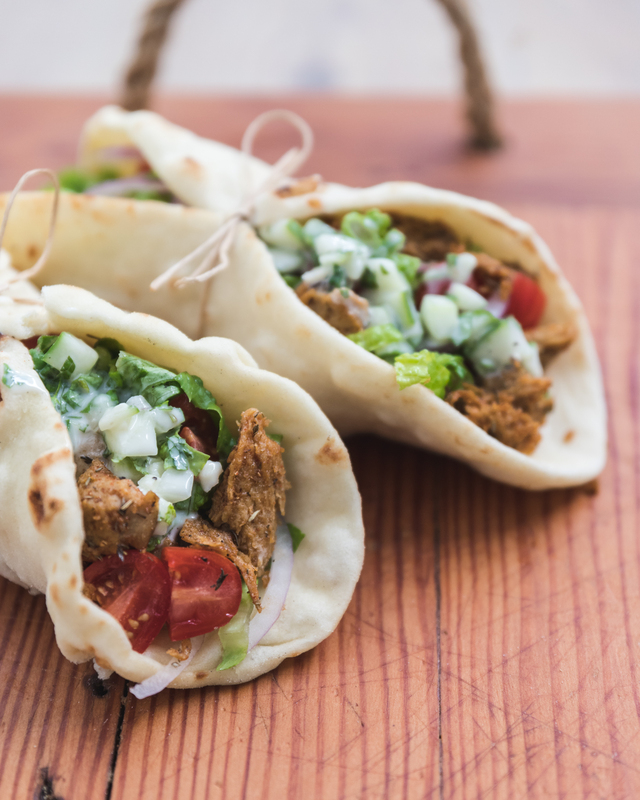 The recipe makes two well-stuffed gyros, but you can also cut the pitas in half and stuff them to make four smaller pockets. Peel the cucumber skin, alternating strips where you leave the skin on or peel it off. Slice the cucumber lengthwise and completely remove the seed bed from each half. Chop into a very small dice. Squeeze the juice from the cucumbers before the next step, because no one likes watery sauce. Set aside. Whisk the yogurt and nutritional yeast together. Add the cucumber and remaining ingredients for the sauce and stir to combine. Cover and refrigerate until it’s time to eat. (Give it at least an hour. Even better if you let it ride overnight). Gently pull the “No Chicken” apart into large pieces and put in a mixing bowl. Mix together those herbs and spices. Toss the No Chicken with 1 tablespoon of the vegetable oil, then toss with the spice mixture until coated. Heat remaining oil in a sauté or grill pan over medium-high heat. Cook that Comrade Cluck until it’s golden brown. Remove from heat. Put some Cluck down the middle of each. Top with spoonfuls of tzatziki sauce, followed by some lettuce, tomato, and red onion. Serve immediately. You don’t have to use the probiotic powder if you don’t have it; it just thickens up the yogurt some to make it more Greek-style. Soak cashews in 1 cup of the filtered water for at least 2 hours, preferably overnight. Drain. Toss those nuts in a blender with ¾ cup filtered water and the rest of the ingredients. Blend until smooth. Refrigerate for at least 2 hours before use if you used the probiotics.